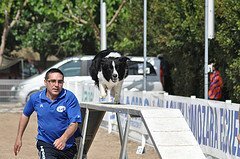 You may discover that the dog agility equipment used in competitions may vary in construction depending on an organizations rules and regulations, even so the rudimentary format of the obstacles remains the same in most agility trials. The A frame is typically made from two 3 feet (0.91m) wide by 8 to 9 feet long ramps, hinged together to form the 'A' , when erected the apex of the frame stands some 5 to 6 and a quarter feet above the ground (heights may vary according to organizations)The bottom 36 to 42 inches (0.91 to 1.1 m) of both sides of the A-frame are painted a bright color. This area is known as the contact Zone. It is here that the dog must make contact with the 'A' frame with at least one paw when climbing this apparatus, and also entering the contact zone on the decent side of the frame. Many penalty points are incurred at this stage as the dogs will often over jump on entry or on exit in their enthusiasm, it is here that the handlers must control their dogs and steady them down. 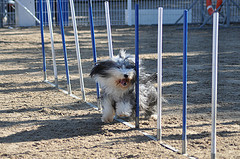 Many sanctioning bodies stipulate that thin, narrow slats are attached horizontally along their length to give the dogs a little grip when ascending and descending, the top of the 'A' frame may be narrower than the base according to some organizations rules. The dog walk is constructed from three 8 to 12 foot (2.4 to 3.7 m) long boards. The center board being raised 4 feet (1.2m) above the ground, with a ramp at each end, a entrance contact zone on the up ramp and an exit contact zone on the down ramp, similar to the 'A' frame thin narrow slats are attached to the ramps to aid the dogs grip. The teeter-totter otherwise known as the see-saw is made from a 10 to 12 foot(3 to 3.7m) board which is set to pivot on a fulcrum (pin) again the ever present entrance and exit contact zones are to be clearly marked. The see-saw is made a little off-balance to allow the board to return to the ground at the starting side, off-setting the board is done by either having the support off-center or by weighting one end of then board. 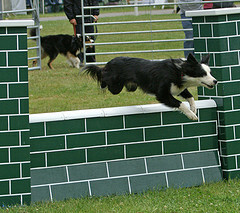 The crossover obstacle is very rarely seen in competitions today having been discontinued by the kennel club in 2009 and the Agility Association of Canada. 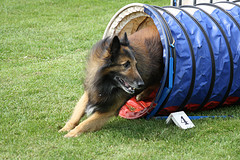 There are no major agility associations in the United States who allow the use of the crossover in competitions as too many accidents were being recorded when using this type of dog agility equipment. The structure of this simplistic task is a rigid cylinder chute with a cloth tube attached at one end, the cloth tube lies flat and extends approximation 8 to 12 feet (2.4 to 3.7 m). 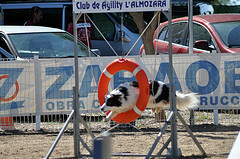 The dog enters the tube not knowing what lies at the other end, showing faith in his handlers judgment. The double bar has two upright posts supporting two horizontal bars facing forward or back from each other. Either double parallel or ascending horizontal bars are permitted. 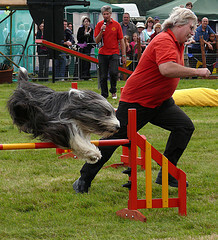 The triple jump is a similar set up but always has ascending horizontal bars,the distance between the bars is often adjusted according to the size of the dog. a set of 4 or 5 raised platforms that are laid out on the ground to form a wide area that the dog must clear without making contact, again adjustable for different sized dogs. A suspended tire size hoop for the dogs to jump through, these are usually brightly colored to assist the dogs visibility enabling them to judge their jump. 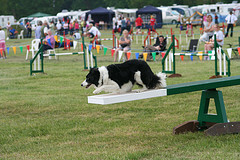 The pause table is the simplest piece of dog agility equipment, where the dog must come to rest for a certain period of time before continuing with the trial usually 5 seconds is the allotted time for the dog to remain sitting or in a down position. 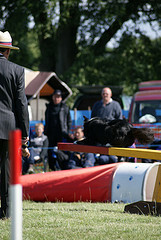 The raised platform is 1 meter square, and the height from 8 to 30 inches according to the dogs height as laid down in the various organizations rules. In some trial a simple marked off area is used for the dog to execute this task. 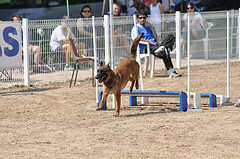 A slalom course of 5 to 12 poles each proximately 3 feet high and 20 inches apart are placed on the course for the dog to weave in and out of, commencing with the first pole in the series to his left, the next pole to his right and so on through the slalom not missing any poles. The weaving action does not come naturally to any dog making this a very difficult obstacle to overcome. Certainly in my opinion one of the most exciting to watch as it requires speed and dexterity to master. 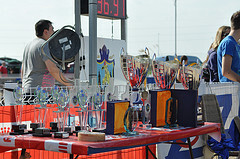 As mentioned earlier heights are adjusted to accommodate various breeds of dogs as are other numerous rules and regulations governing this type of competition. 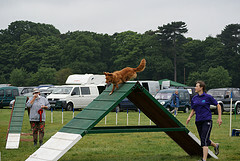 An assortment of classes and course dog agility equipment are set out, not only to test the dogs and handlers but also for the entertainment of the spectators. The rewards for the tremendous efforts, Trophies for the handlers the dogs do not know if they have won or lost, they do it for the fun. 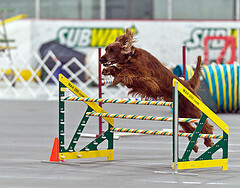 All this can be started with backyard dog agility training, make your own dog agility equipment to get you started.